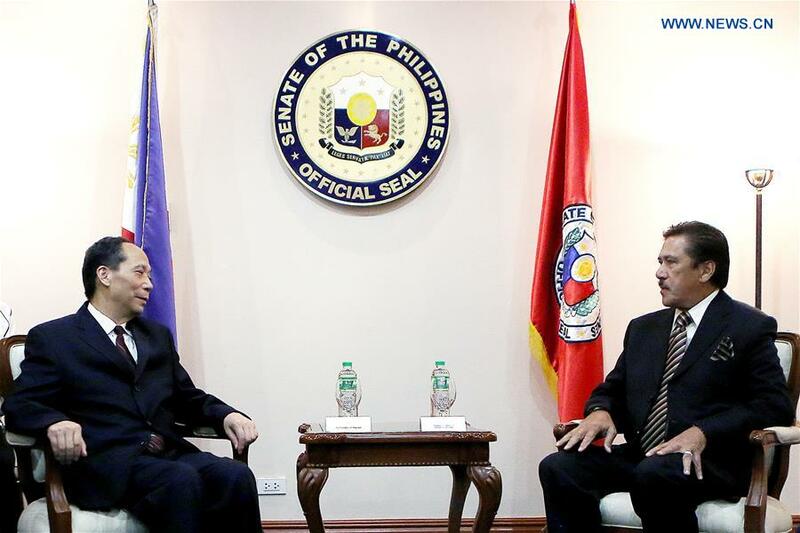 MANILA, Sept. 11 (Xinhua) -- A senior Chinese legislator has hailed the development of relationship between China and the Philippines under the guidance of the two countries' leaders. Ji Bingxuan, vice chairman of the Standing Committee of the National People's Congress of China, paid a four-day visit to the Philippines from Saturday to Tuesday. During his visit, Ji met with Philippine House of Representatives Speaker and former Philippine President Gloria Macapagal Arroyo, Deputy Speaker Arthur Yap, and held talks with President of the Senate Vicente Sotto III. He said China's legislators are willing to work with their counterparts in the Philippines to implement the important consensus reached between the leaders of the two countries and strengthen friendly exchange and cooperation between the two sides, so as to provide legal and policy guarantee and create a sound environment for the development of a long-term, steady relationship. The Philippine side said the Philippines attaches great importance to its relations with China, and is willing to connect the country's "Build, Build, Build" program with China's Belt and Road Initiative, deepen legislature communication and pragmatic cooperation with China in various fields in order to push forward bilateral relations.